When a horse has a high head and a hollow back, that usually means that the horse’s hindquarters are not “engaged”. By that it is meant that there is not enough propulsion or energy coming from “behind” – the horse is trotting or loping out behind himself rather than up under himself with his hind legs, which causes him to be strung out and hollow backed and high headed. When a horse is engaged and working energetically behind, he rounds his whole topline which raises his back ! Yeah ! So, you want to start working from the back to the front NOT from the front to the back. You want to work on developing more forward movement from the hindquarters. You mention “she doesn’t travel behind the vertical” – well that is a good thing ! A horse in balance and working energetically forward will hold its head and neck in a nice balanced position with its nose approximately 10 to 15 degrees IN FRONT of the vertical – that’s a nice place for both you and the horse to have a back and forth communication. So you want to work on forward, long and low exercises to strengthen her back and abdominal muscles and then slowly gather her up and start to collect her – but this will take months of training. Be patient and work for degrees of improvement. A good reference for you would be 101 Arena Exercises. Look at the frame of the two horses on the cover of my book below – I looked through hundreds of photos to find these two which exemplify balanced working frames and as you can see, both of the horses carry their heads in front of the vertical. 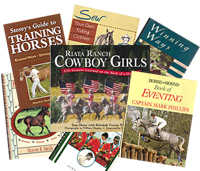 I’m also going to provide you with some links to more articles on my website that talk about the phases of training and collection for your continued reading enjoyment and reference. Balance is equilibrium, a state where weight is equally distributed. 90 percent of humans are right-handed but both left- and right-handed riders need to be ambidextrous. The rider who is equally strong and coordinated on both sides has a better chance of having a comfortable and safe ride. Stretching and strength-training exercises can help you even your left and rights sides. When riding, first pay attention to your posture at the halt and walk. Work on form before you add speed. Stand in your stirrups at all 3 gaits to improve your balance. When cleaning stalls, switch the normal position of your hands on the fork. When grooming, hold the curry in the opposite hand. Open gates and stalls with a different hand every day. Lead from the off side. Mount from the off side.